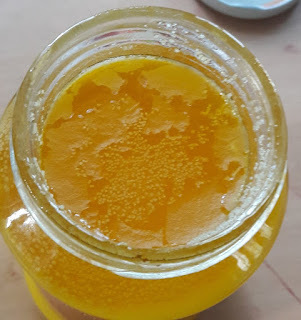 One of my favourite natural fats is Ghee, I absolutely LOVE it. Ghee Is in my daily cooking like chapati , ladoo , peda, kheer (payasam) cookies and cakes. etc . Ghee Provides Essential Vitamins in our body its Provides Essential Healthy Fats too. Ghee (clarified butter) / साजुक तुप is Low In Fat , Digestion and also Strengthens our Immune System. You can buy Amul fresh full fat cream if milk fat (दुधाची साई ) is not available. its long process to make ghee…to collect everyday s milk fat etc…but cooking process is easy. हमारी आध्यात्मिक ज़िंदगी और हमारी हमेशा की ज़िंदगी इसी बात पर टिकी है कि हम ‘परमेश्वर के मुख से निकलनेवाले हर एक वचन’ से लगातार ताकत हासिल करते रहें।—मत्ती 4:4.
our spiritual life, and hence our eternal life, depends on our being regularly nourished on “every utterance coming forth through Jehovah’s mouth.”—Matthew 4:4. Keep all your collected milk fat in room temperature. Churn the cream with half cup of water in mixer 3 or 4 minute . You will get butter or as we would call it ‘loni’. Add the butter to a large saucepan over a low flame and let it melt. This should take around 12-15 minutes. A layer of white foam will appear over the surface skim it off with a spoon. Make sure to scrape off the sides although there is no need to stir the bottom of the pan. You need the milk solids to settle so you can see the layers. Skim off any additional foam that collects over the top and turn the heat off. 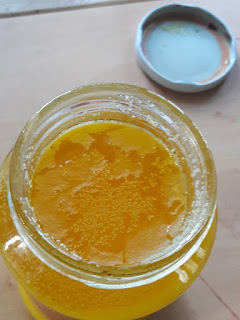 Strain ghee in Glass container or bharni. your home made pure ghee is ready to bake cookies, to make biryani or to roast parathas. Its very imp step To keep milk fat at room temperature if u forget you will not get butter to make ghee. its just whipped cream. salt is use for preservatives purpose you can skip salt.